This is a sale for a brand new genuine 98-01 JDM Honda Integra Type R B18C Countershaft Collar Ring & Needle Bearings Set from Honda Motors, Japan. It will fit the JDM Integra Type R 98+ S80 4.785 Final Drive Ratio Transmission or B-series DOHC VTEC transmission with the 4.785 Final Drive swap. 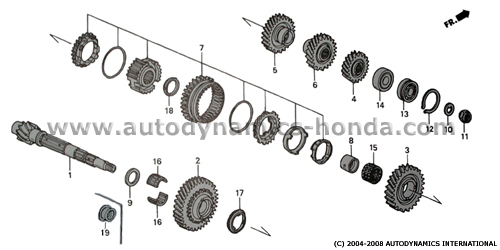 The countershaft collar ring & needle bearings are No.19 and No.16s respectively in the B-series DOHC VTEC hydraulic transmission countershaft components diagram below.